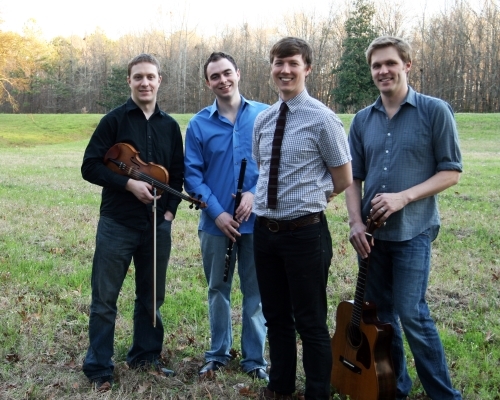 Bua has performed at many of the top Irish and folk festivals in North America including the National Folk Festival, the Milwaukee Irish Festival, the Lowell Folk Festival, the Dublin Irish Festival, The University of Chicago Folk Festival, Goderich Celtic Roots Festival, CityFolk, Catskills Irish Arts Week and Bethlehem’s Celtic Classic. Brían Ó hAirt’s evocative singing, often in Irish Gaelic, is central to Bua’s unique sound. His ability as a traditional singer has afforded him great acclaim at his age—the youngest and only American to become a champion All-Ireland singer. With a voice Muireann Nic Amhlaoibh of Danú hails as “beautiful…sweet and full of sensitivity,” his singing has been featured on radio programs in Ireland and the U.S. Brían’s dedication to sean-nós (old style) singing and the Irish language has bonded him to the close-knit singing communities of Conamara (on Ireland’s culturally rich west coast). Driftwood Magazine writes: “O’Hairt has a touch with the old songs that just can’t be faked. His voice has the beautiful fragility of the great Irish singers.” Bua’s shows also feature Brían’s mastery of the improvisational sean-nós Irish dance style and his deft finger-work on the concertina. Sean Gavin’s playing on the flute, whistle and uilleann pipes reflects his lifelong immersion in, devotion to, and love for traditional Irish music. This was no doubt encouraged by his County Clare-born, fiddle playing father, Mick Gavin. As a boy in Detroit, Sean played a variety of Irish instruments until settling on the flute at age 10, inspired by Scariff flautist Leo MacNamara. Not long after, he began work on the uilleann pipes with teacher Al Purcell—himself a student of famed piper Leo Rowsome. Currently residing in Chicago, he deeply values his many opportunities to hear, talk with and learn from Sligo flute legend Kevin Henry. Sean is a member of the acclaimed group NicGaviskey, often performs with his family and remains firmly dedicated to playing and teaching traditional Irish music. Paired with Gavin’s work on flute and pipes is the fiddle playing of his long-time friend Devin Shephard from Chicago. Devin began Suzuki violin lessons at age four, but fell in love with traditional Irish music at ten. His mother nurtured his interest, immersing him in the deep-rooted Irish music scene of his hometown, where he studied with Kathleen Keane and Liz Carroll and regularly attended sessions. As a young fiddler, Devin won first prize in the Midwest Fleadh Cheoil for nine consecutive years. More recently, his stylistic development has focused on recordings of legendary Irish fiddlers of the past, such as Bobby Casey, Michael Coleman, and John Doherty, as well as living legends James Kelly and Paddy Cronin. Since 2000, he has made his living teaching and performing Irish music throughout the U.S. and abroad. Guitarist Brian Miller comes from Saint Paul, Minnesota where a vibrant Irish music community, including luminaries Dáithí Sproule and Paddy O’Brien, has supported his growth into one of the most sought after accompanists in the American Irish music scene. As critic Earle Hitchner put it: Brian’s backing on guitar “flexes not just muscle but a fully complementary style.” Also a master of the Greek bouzouki, Brian is a founding member of the Two Tap Trio and the Doon Céilí Band back in Minnesota and he frequently tours with the band Chulrua as well as with the Máirtín de Cógáin Project. He has been featured on MPR’s All Things Considered, CBC Radio’s Canada Live, and Ireland’s RTE television, RTE radio and TG4 television. Brian teaches flute, whistle, bouzouki and guitar at the St. Paul-based Center for Irish Music.